I used Paper Temptress cardstock in a very shimmery white, then embossed it and highlighted it with Poinsettia ink. The background- also embossed and the Coordinations has a white core- so I sanded it lightly. Both techniques I learned from Technique Junkies. I finished off the card with Sweetcuts die cut flowers and rhinestones. WOW!!! What a beautiful Valentine, Shelly!!! The heart die cuts are sooo beautiful and I just love the little swans in the center!!!!! Shelly this is gorgeous and I love the beautiful textures and colouring. Pretty card and perfect for Valentine's Day for someone special. I like all the heart layers and you are right, using this design would make a fabulous white on white card. I like the small flower die with the hearts, such a pretty Valentine! Shelly, this is beautiful! A perfect card for Valentine's or just love. Gorgeous! 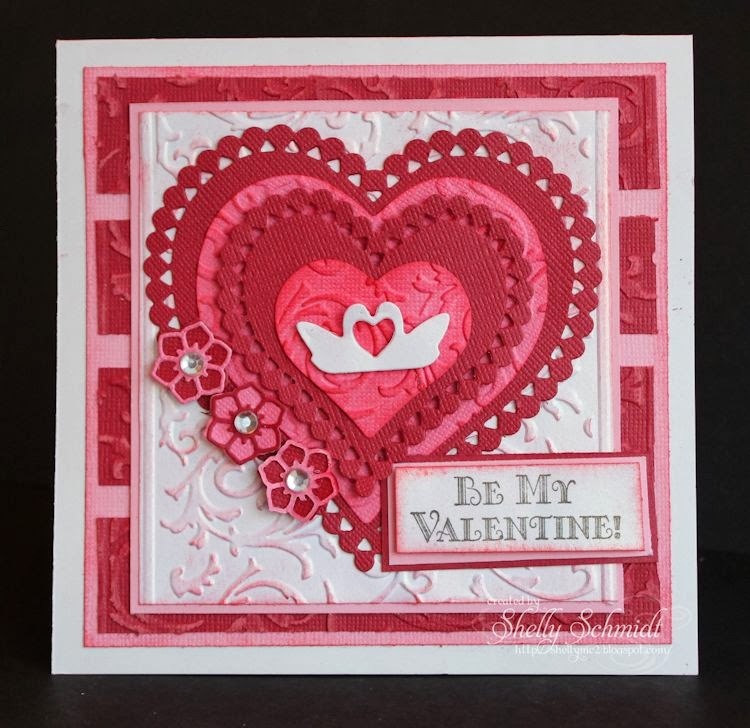 Beautiful Valentine, love the many layers with the embossing and the little flower dies with the rhinestones. This is so beautiful! I love what you've done with the flower! This is gorgeous! I love what you've done with the little flower! Fabulous card Shelly - love the white swans in the centre of the hearts. Who would refuse to be your valentine when receiving a card like that! Stunning. I love all the layers of hearts. I'll be your Valentine Shelly! This is so pretty, lovely layers and papers and rhinestones OH my! Shelly, this is GORGEOUS! Love all those lacy layers! Let me call you sweetheart! I just love your Valentine's Day card and all those sweet-hearts! So pretty! I LOVE this card!!! The hearts are great and it's so dimensional-looking. Saw you on MIM! This is lovely! Thank you so much for sharing this with us at MIM! Remember, to be in the running to win the prize from our sponsor this week just leave a comment for another entry. Be sure to mention you saw them on Make It Monday. The more entries you comment on the more chances you have of winning! This is the epitome of what a Valentine should look like. AWESOME! Technique Fun and my trip!